RE•WORK | Blog - Empowering Diversity in AI: Have You Heard About RE•WORK Women in AI Dinners? Empowering Diversity in AI: Have You Heard About RE•WORK Women in AI Dinners? 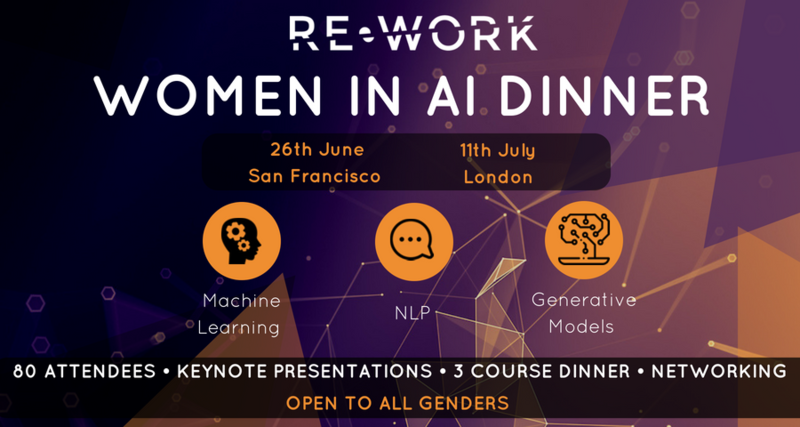 Since 2016, RE•WORK have been organising Women in Artificial Intelligence Dinners, and we’re excited to continue the series with the next dinners coming up in San Francisco and London. Providing plenty of networking opportunities, key discussions and the chance to hear from leading female experts, these dinners are a great way to build connections, find mentors and consider the impact of this rapidly advancing technology. If you missed our Women in Machine Intelligence Dinner in San Francisco in January, then make sure you join us on June 26th. Topics covered throughout the evening will include how to efficiently prepare problems before applying Machine Learning, building agents that can see, talk, act and reason, and Deep Neural Networks. The evening will be hosted by Susan Fahringer, partner at Perkins Coie, who currently serves as co-chair of the firm’s Artificial Intelligence and Machine Learning and Robotics industry group. In her talk, Negin will draw examples from real applications to show the necessity of spending time on defining problems accurately before diving for solutions with machine learning. Devi will be discussing efforts towards building agents that can see, talk, act, and reason, including the possibility of building machines that can hold a sequential natural language conversation with humans about visual content. Rosanne’s talk will focus on calculating the intrinsic dimension of objective landscapes in deep neural networks, as well as the findings, implications and benefits this brings. Find out more information about the event and register your tickets here. Following on from another successful evening in London back in February, we’re delighted to be hosting another dinner on July 11 with our speakers bringing a breadth of experience and expertise on a range of topics, including AI in Drug Discovery, Word Embeddings and Self Interested Agents. The event will be hosted by Sally Eaves, who is an official member of the Forbes Technology Council and well-established CTO and Global Strategic Advisor. Noor will be discussing the work of GTN, and how they combine advanced generative machine learning models with cutting edge quantum physics methods to address the main bottlenecks in drug development. Aleksandra will look into the challenges state of the art word embedding methodologies face when applied to real-world, human-generated text, and explore strategies of alleviating some of these problems. Sofia is part of the multi-agent systems team and will be discussing her work to lead self-interested agents towards desired outcomes. The technology at Prowler.io can be applied to a range of industries, including finance, robotics, smart cities and autonomous vehicles. For more information about the speakers, their talks and to register for the dinner, you can check out the website here. Will you be joining us at our dinners? If you have any questions about the events or would like to recommend a speaker, please contact Elizabeth Szymczak at elizabeth@re-work.co.